When The Cross Keys in Kippen (est 1703) and Fallen Brewing (est 2012) in Kippen agreed to get involved in a project to create their very own house ale, there was only ever going to be one name for the beer. Five tasting evenings and eight different versions of the beer later, the fine folks of Kippen decided on the final version. Created for the locals, by the locals, 1703 is a classic amber session beer. Low ABV with a citrus bite and a warming caramel toffee backbone, this is one to enjoy while relaxing with friends. 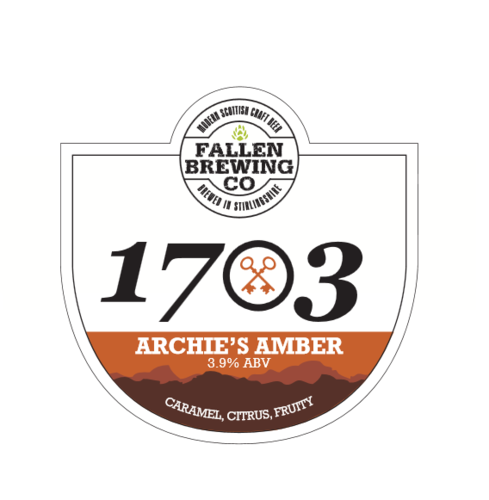 The full name of the beer became ‘1703 – Archie’s Amber’. The 1703 being the date The Cross Keys was established and Archie after the owners' son. We hope our customers enjoy drinking it as much as we enjoyed creating it.